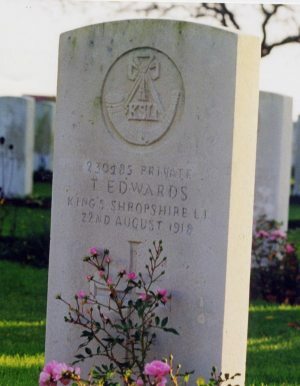 THOMAS EDWARDS (Initially No: 2485, Shropshire Yeomanry, latterly No: 230485, KSLI) was born in Cleobury Mortimer and was living in Plaish when he enlisted in Shrewsbury. He was killed in action on 22 August 1918 whilst serving with 10th Battalion KSLI near St. Floris. He is buried in Vielle Chappelle New Military Cemetery at Lacoutre.